An Ottawa-area church has expanded its facility to accommodate its growing congregation with an open interior using efficient design elements. Phase one for Orléans’ Bilberry Creek Baptist Church was completed in 1993, and involved the creation of a small multipurpose hall that doubled as the sanctuary. It included a kitchen and foyer and was augmented with portable modular units for offices and classrooms. The church’s growth, in addition to the decision to share its facility with a sister congregation of French-speaking Baptists—the Église Évangélique Baptiste d’Orléans—was the impetus for planning the second phase of building. The 650-m2 (7000-sf) expansion provides enough space for both congregations to meet on Sunday mornings, and encourages new membership in both groups. Design features of the new hall expansion included seating for 400, an expanded foyer, a multi-purpose room and classroom space, and additional parking. The church chose Kanata, Ont.-based Ralph Vandenberg of Vandenberg & Wildeboer Architects to design the expansion, and Ottawa’s design-build contractor BBS Construction Ltd,. as the construction manager—they had also been on the team for constructing the conventional structure in phase one. The design concept placed the new sanctuary to the right of the original building, with additional elements bridging the space between. Temporary classrooms (planned to be replaced in a third phase of construction) were kept, with some connected to the expanded foyer in front and the rest moved to the rear of the new 371.6-m2 (4000-sf) sanctuary. It complemented the original building, also featuring a clerestory window along the roof peak. 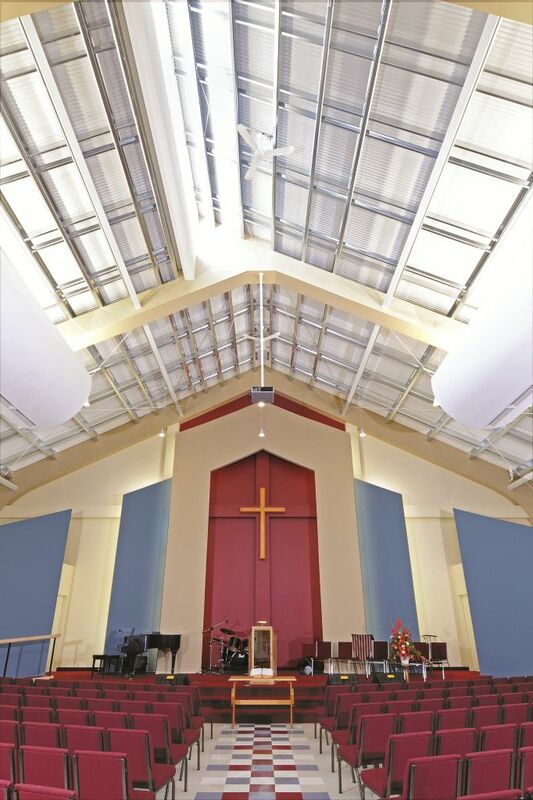 The design for the sanctuary interior was simple but striking—featuring shaped wallboard backlit by recessed lighting and bold red and blue accent colours to contrast with the white walls and ceilings. A modular framing system with acrylic-coated galvanized structural members was specified for its durability and low maintenance requirements. The design plan provided the church with an open interior, with no pillars, and a structural system to support the clerestory window. The modular framing system used acrylic-coated galvanized structural members for durability and reduced maintenance. Previously, the original roof system had been replaced on the temporary structures with a low-maintenance architectural standing-seam roof. The same system was employed for the expansion and includes 152-mm (16-in.) 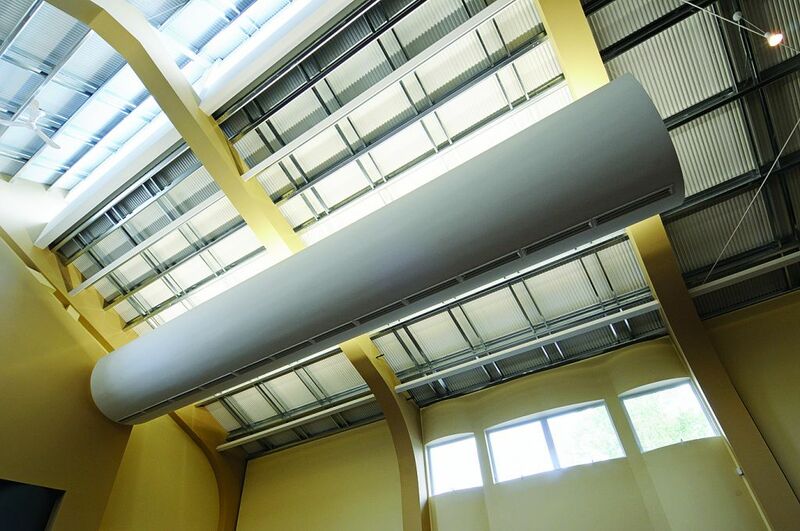 wide panels, manufactured from 24-gauge steel in cool roof fluoropolymer formulations to decrease heat gain. The proprietary roofing system also boasts a finished metal liner panel that enhances the contemporary, open structure of the ceiling. For energy efficiency, an insulation system with an R-value of 30 was also installed. To further tie the expansion to the original structure, the exterior was given pre-finished wood wall panels. Since the church needed an audio-visual screen at the front, the clerestory window was used only at the rear of the sanctuary, leaving the screen dark enough to read when in use. Auxiliary and accent lighting provide illumination when needed. The focal point and finishing touch for the interior of the sanctuary is its simple wooden cross—rescued from a demolished Canadian Army chapel in Ottawa and restored by members of the congregation. The second phase was completed in early 2010, with plans for a third phase currently in development. Kevin Hutchings has been the training manager for Butler Manufacturing for 15 years and is responsible for product, builder management, and sales training. He joined Butler as an order technician for the buildings division and in the retrofit roof group, where he gained substantial experience in metal roof design and detailing. Hutchings has also served as project services manager for the roof division of Butler, managing a number of large and complex retrofit roof projects. Hutchings can be contacted at jkhutchings@butlermfg.com.